(Macau Daily) The sixth meeting of the 10 th council of the Red Cross Society of China (RCSC) was held in Beijing recently. Chen Zhu, Vice Chairman of the Standing Committee of the National People's Congress and President of the RCSC, attended the meeting and made a significant speech. Chou Kuok Hei, Vice President of Central Council of Macau Red Cross (MRC), and Chum Pak Tak, Vice President of Directive Council of Macau Red Cross, also attended the meeting. Multiple work reports of RCSC in 2018 were adopted during the meeting, and also donors who made great contributions in 2018 were awarded with medals. Zhang Jun, Lian Weiliang and Yin Deming were elected as Vice Presidents of the RCSC. Chen Zhu emphasized that the National Red Cross System should keep on adhere to people as the core of work orientation, and strive to help improving the situation of the most vulnerable groups as the starting point and foothold of work of the Red Cross. In addition, they should enhance the capacity and level of humanitarian services, and mobilize community forces extensively to participate in humanitarian works. During the meeting, Liang Huiling, the new Party Secretary and Executive Vice President of the RCSC, met with the representatives of Hong Kong and Macau Red Cross to affirm their supports and contributions to the RCSC. 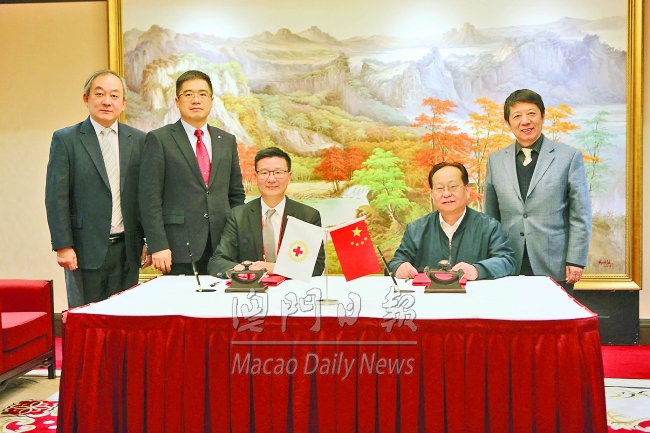 The RCSC will strengthen the exchange and cooperation among the Red Cross Societies of Hong Kong and Macau, and Taiwan Red Cross Association in order to promote cultural identity. Macau Red Cross has signed a three-year framework agreement on cooperation projects with the RCSC to promote exchange and sharing in information, technical support, personnel and resources. They will also work with the RCSC by providing necessary support to those provincial districts which are in need of assistance and to related areas. Moreover, they will help to increase the awareness of disaster preparedness and the ability of responding to sudden disasters among people. The agreement will strengthen and standardize the cooperation on disasters preparedness, disasters reduction, Red Cross youth development, volunteer service, and first-aid training of the RCSC and MRC. Also, it will actively carry out humanitarian education and to enhance the level of international exchange and cooperation in youth domain. The agreement was signed by Wang Ping, Vice President of the RCSC, and Chou Kuok Hei, Vice President of Central Council of MRC.